The Elf was only an infant when the earth cracked open, the sky fell, and terrible demons ravaged his forest home. He couldn’t remember the apocalypse itself, only the ruination and chaos that followed in the years after. Now, he is determined to bring order and harmony back to the realm, to revitalize the forests and all nature. 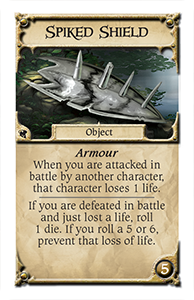 That means exploring the realm’s wreckage, meeting its denizens, and fighting its enemies in order to seize the Crown of Command. 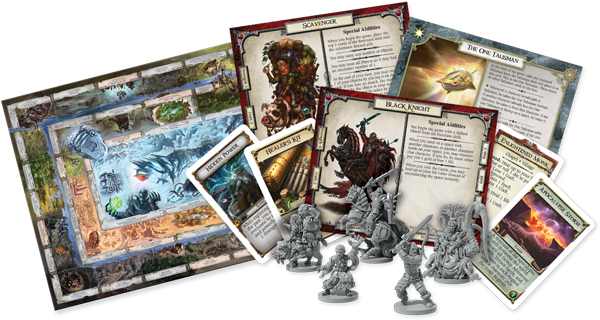 Fantasy Flight Games is proud to announce The Cataclysm, an expansion for Talisman that takes place one generation after a terrible apocalypse has devastated the land. The Cataclysm brings to life a realm that is built upon, but utterly unlike, the Talisman of old. 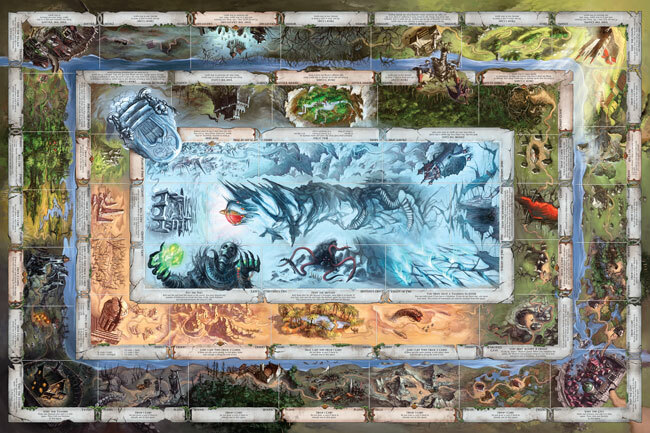 A new game board replaces that of the base game, with every space from the Fields to the Valley of Fire altered by the apocalypse and its aftermath. Remnants of former civilization are scattered everywhere from the Desert to the Graveyard. Much of the former population either died or fled, and only now are people returning to establish permanent settlements. Five more characters enter the quest for the Crown of Command alongside those, like the Elf, who sought it before, and four new alternative endings reinvent that quest for these post-apocalyptic times. The realm is now a ravaged wasteland experiencing the first stages of renewal. The Outer Region was once temperate and verdant, but now its plains, hills, fields, and woods are filled with the wreckage of buildings and dried-out bones, home to mongrels and scavenging marauders. Strange new life forms flourish in the Hidden Valley and around the Oasis of the Middle Region, but the Castle where the Royal Doctor once practiced medicine is in ruins and overgrown, destroyed when the Black Knight chose to abandon his post. The Inner Region, once a scorching inferno, is now frozen over. A Snowbeast lurks in the Pits and a chimeral Mutant inhabits the Werewolf’s den. The Vampires long ago left their tower, now called the Frozen Spire and famous for its unnatural, lethal chill. 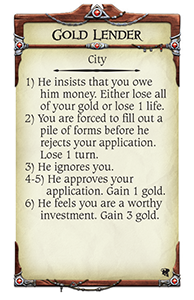 The new game board makes manifest all these changes and their effects upon wanderers. 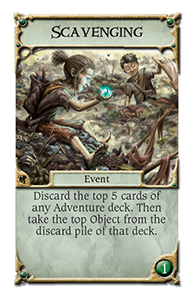 Yet the realm has still not finished transforming with new Terrain cards that continue to alter the landscape throughout your adventures. In The Cataclysm, Talisman is teeming with traces of the past even as the realm’s revitalization begins. 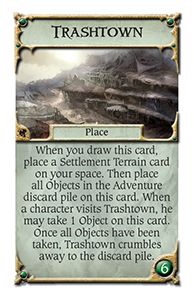 The expansion’s Remnants deck scatters fragments of the former world and the apocalypse throughout the Outer and Middle regions. 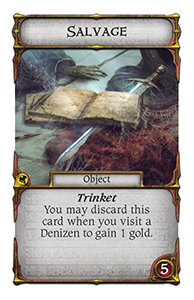 In the Graveyard you may discover Salvage that can be exchanged for Gold or Broken Armour that can be repaired. In fact, many things that were once considered trash have now become treasures. 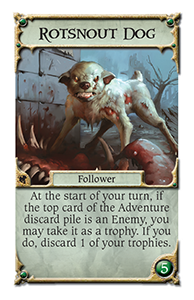 New cards in the Adventure deck enable you to go Scavenging for valuable Objects or take a carrion-sniffing Rotsnout Dog as a follower. You may even find a landfill that has been reinvented as a Trashtown , where heaps of rubbish are inhabited and discarded Objects become useful once more. Yet the apocalypse still lingers. 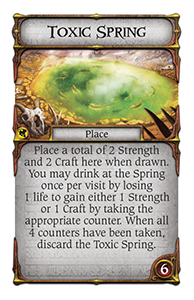 A Toxic Spring may be the cause of the strange creatures who now inhabit the Hidden Valley, and occasionally an Apocalypse Storm passes through the land, erasing all recent developments and eradicating the Strangers, Enemies, and all those who have spent years struggling to renew a ruined land. 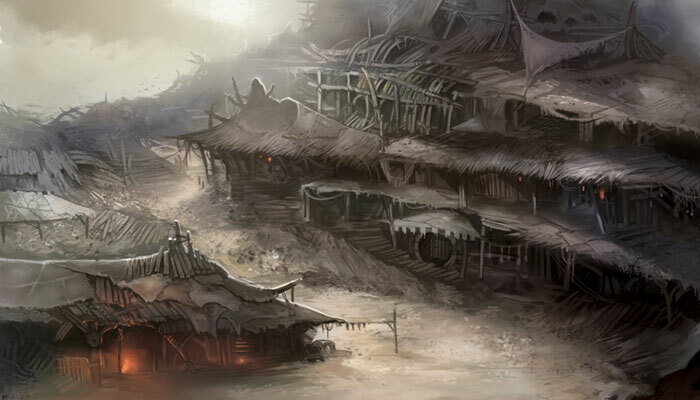 Even with the perils presented by storms, demons, looters, and slavers, the former inhabitants of Talisman are returning. 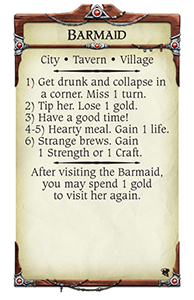 The Denizens deck brings these determined people to the City, Chapel, Village and Tavern. Some, such as the Barmaid , are simply trying to eke out a living for themselves. Others, like the Gold Lender , hope to profit at the expense of others. 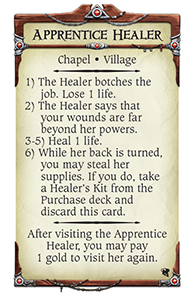 A scarce few, such as the Doctor and his well-intentioned Apprentice Healer , strive to make the realm a better place. 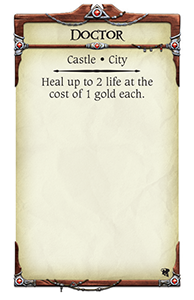 The realm’s current, chaotic state has prompted five characters who never before considered it to seek the Crown of Command. 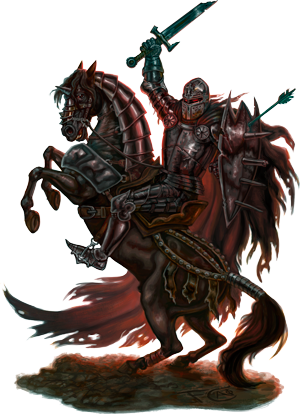 Among them is the same Black Knight who used to once menace travelers near the Portal of Power. 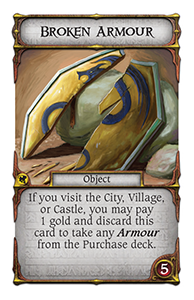 Now, he rides throughout Talisman bearing a Spiked Shield , forcing the characters he encounters to either give him gold or give up one of their lives. The apocalypse wiped out the realm of Talisman as you knew it. That devastation, however, created unprecedented opportunities for transformation, rebirth, and adventure. No one can tell what may happen in this brave new world, but come what may, you have a chance to experience it. At this moment the dark omens, demons, and warp storms of The Harbinger are ravaging the realm. 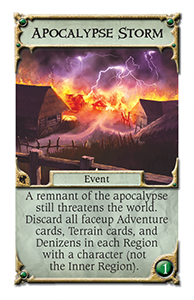 Your adventures in post-apocalyptic Talisman will begin when The Cataclysm becomes available in the first quarter of 2016. 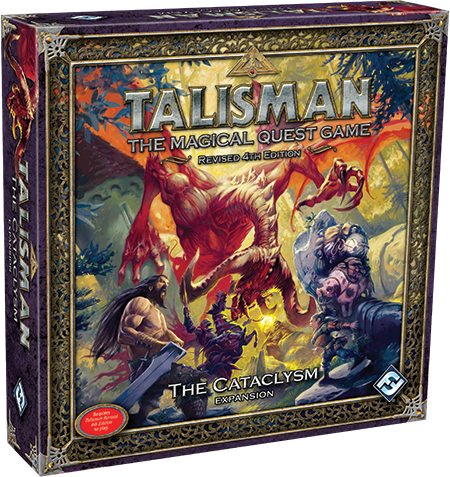 Talisman: The Cataclysm © Games Workshop Limited 2015. Talisman, GW, Games Workshop, the Games Workshop logo and all associated marks, logos, places, names, creatures, races and race insignia/devices/logos/symbols, vehicles, locations, weapons, units and unit insignia, characters, products and illustrations from the Talisman world are either ® or TM, and/or © Games Workshop Limited, variably registered in the UK and other countries around the world. This edition published under license to Fantasy Flight Publishing, Inc. Fantasy Flight Supply is a trademark of Fantasy Flight Publishing, Inc. Fantasy Flight Games and the FFG logo are registered trademarks of Fantasy Flight Publishing, Inc. All rights reserved to their respective owners.